On the outskirts of Dangiyon Ka Hundar, a small village in western India, Durga strolls down a winding path that separates the dusty main road from vast plots of farmland. It’s mid-afternoon, and she’s left crop tending early to run errands. But unlike the grocery run or quick trip to the bank you or I might typically experience, Durga’s to-do list revolves around something we take for granted every day: She’s out to collect her energy for the week. She starts by walking a kilometer to the village well and a kilometer back home to drop the water off. She then heads out on a two-kilometer walk to meet her husband in the town center where they pay a small storefront owner to charge the family’s mobile phone. While they leave the phone to charge up for 30 minutes, they head to another shop where they purchase a liter of kerosene to light their un-electrified home and a bundle of firewood for the open cooking fire she uses every day. An hour later, they are back home and have spent up to 15 percent of their monthly income on inefficient energy sources. From a proportional standpoint, that is three times more than most middle-class American families pay for their energy utilities. Not only are Durga’s energy sources expensive – with families paying up to US$100 per kilowatt-hour or 400 times more than the typical American to charge their mobile phone – but they’re dangerous, too: Household pollution from open cooking fires and dirty kerosene leads to serious health complications and kills 4 million people annually – more than AIDS, tuberculosis and malaria combined. Durga and her family face an energy paradox, caught in the cycle of relying on bad energy sources that, in turn, put a further strain on family finances and well being. Here at BioLite, we’re out to break that cycle with innovative technology and, thanks to Durga, a viable path to ownership (more on that in a second). BioLite’s flagship product in India and sub-Saharan Africa is a smokeless wood-burning stove that reduces toxic emissions by 90 percent, uses half the fuel, and generates usable electricity. Through in-depth market testing on willingness to pay, we were able to benchmark the price of our stove around the cost of a local mobile phone, an appliance that has proven to be a valued asset even among the lowest-income households. At roughly $40 to $50, this stove is aspirational but well within reach for almost any family – although ‘within reach’ depends heavily on the financial levers available to the household. At BioLite, we have a team of trained local staff who give compelling village demonstrations of the HomeStove. Our sales agents light the stove, boil water, cook local foods, charge phones, and explain in detail the long-term cost savings of HomeStove ownership -- most notably that the stove pays for itself in less than a year thanks to saving on fuel and mobile charging. Durga attended one of these demonstrations with her husband and was eager to learn more about bringing this into the home. However, upon hearing the upfront cost of $50, Durga hit a roadblock; it wasn’t the harvest season, so the family’s cash reserves were low. However, the ever-resourceful Durga offered up an alternative: Could she pay for the stove in installments? She had previous experience taking out business loans for her farm equipment and a stellar track record of paying them back on time. She asked: Couldn’t the same be done here? No matter how compelling our demonstrations might be, we weren’t going to sell our product if our customers don’t have the cash on hand. For most rural households in our markets, income is sporadic and seasonal, and we needed to offer an alternative to upfront cash sales. Think about it this way: Here in the United States, many of us are pitched on the benefits of solar roof installation. Solar systems are highly efficient and offer long-term savings – but we are rarely asked to pay the $30,000 installation fee upfront. We have access to rebates, installment plans and ways to make these significant investments feasible without tying up all of our cash. This is exactly why consumer financing and credit exist: to make purchasing high-ticket items accessible to a wide network of potential customers. BioLite customers in the United States make purchases using credit, why shouldn’t our customers in India be able to do the same? Microfinance enables low-income families to access small loans, which they can invest in businesses and assets that can generate income and improve living standards. Over that past few decades, Microfinance institutions (MFIs) have changed the way millions of low-income people, particularly women in the developing world, access capital. Credit can be the difference between a bare plot of land and a flourishing farm, a husband and wife trying to find daily work and a family owned and operated business. Consider Durga who works as a farm hand. When it is not harvest season, cash on hand is scarce. MFIs offer her stable liquidity through small loans, giving her the opportunity to start a business, purchase land or equipment for their farm, or weather crises. Families like Durga’s get a jumpstart to fulfill financial aspirations. It is hard to think of a better place for us to reach potential customers than when they are making investments in their financial future. In 2015, we began partnering with local MFIs across India and sub-Saharan Africa. These partnerships open our network to millions of new customers who can easily adjust their loans to include our product. A typical MFI customer looks a lot like Durga: a hard working mother looking for a way to contribute to the family income. Durga borrows from Fullerton, an MFI we partnered with in 2015. When visiting her local branch to borrow US$300 for farming equipment, she met a BioLite sales agent, who gives HomeStove demonstrations to borrowers like Durga. At the end of each demonstration, sales agents let borrowers know they can finance a HomeStove for $4.50 a month via a one-year loan. There is little risk associated with a product that pays for itself based on energy savings in less than a year, and has the stamp of approval from your loan officer. Thanks to her good standing as a Fullerton customer, Durga added a HomeStove to her loan and went home with a life-saving product. She pays the stove off incrementally every other week, and each week her path looks much different. Now, rather than spending excess rupees on firewood or kerosene, Durga uses collects sticks on her way home and uses the HomeStove to power an LED light and the family’s mobile phone. Instead of spending 10 to 15 percent of the family’s monthly income on energy, she generates power from a cooking fire and uses it how and when she sees fit. But for Durga, the small HomeStove loan did much more than give her more the chance to supplement her family’s income and energy in the home. 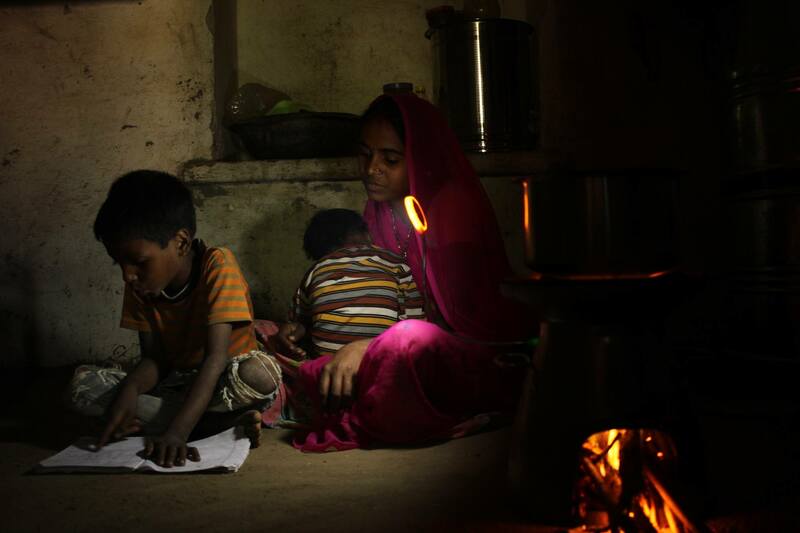 The HomeStove gives Durga more time to spend with her family and with that time a bright light that she uses to read to her two sons after the sun goes down each night. Thanks to MFI partnerships, it’s not only Durga who benefits. Our MFI partners allow our sales agents to reach tens of thousands of other women just like Durga. During these demonstrations, we not only educate new customers on the benefits of a clean, safe and reliable energy alternative, but we also help them get access to financing to bring these life-saving products into their homes. MFIs are a critical lever in allowing BioLite to scale our efforts and bring us a step closer to reaching all of the families looking to break out of the cycle of energy poverty. Jonathan Cedar is CEO and co-founder of BioLite, a social enterprise that develops and manufactures clean, affordable energy systems for off-grid communities around the world. This article is part of BioLite’s The Road To Impact series which takes an in-depth look at their work in emerging markets.